Schedules are super functional for our students. Even though we often start out with a visual schedule in our primary classrooms (I have a whole wall of them! ), the goal is to move to something portable and more functional. How many of us carry around a calendar or planner? Who keeps a calendar on their phone? These are schedules for us and we want to move our students to that point as well. 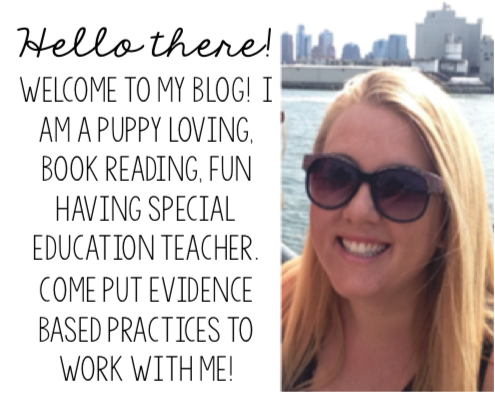 We all know using a visual schedule is an evidence based practice for our students with Autism. It really structures their day and shows them what to expect throughout the day. I usually teach my students to utilize their schedule and check their schedule using a prompting and fading plan from most to least intrusive prompts. 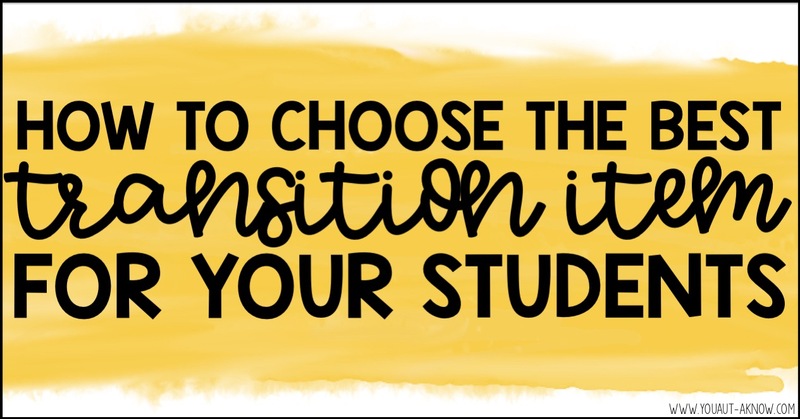 Don't cue students to "check their schedule" throughout the day; the verbal prompt may be helpful but it makes students reliant upon us to tell them when to transition in the classroom. Think of some natural cues in your environment that will alert students that an activity or station is complete. I often use a cue such as "All done with math." This is natural to the context and students are then prompted to clean up and transition to another center. But what about the students who are not yet able to respond to these verbal cues? This is where I pull in transition items throughout the school day. Transition items are really the way to go. When you pair a visual with your verbal cue of "All done X", you're adding information for our students who struggle to understand language. 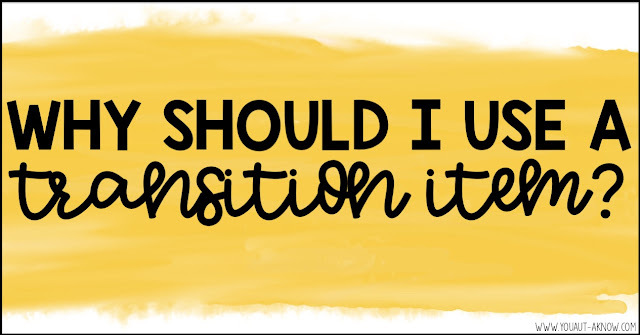 Now I'm sure you're already full of a ton of questions, so here are some basics about transition items. Transition items are simply an item that signals or cues a student that an activity has ended and it is time to transition to a new activity. These items can be functional to their schedule routine or they can be preferred items to ease in anxiety between transitions. Let's be real. Transitions happen ALL. THE. TIME. 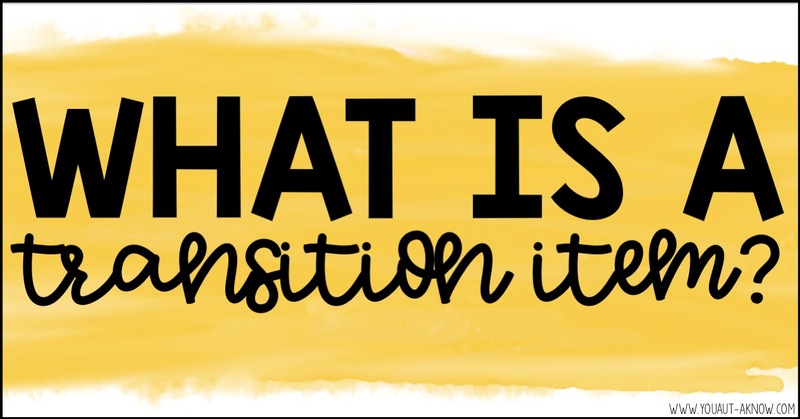 Our students need to learn transition skills so they can engage in their learning, access peers at recess times, and become independent workers as they are adults. But the fact remains that some of our students REALLY struggle with transitions. They're hard. We have to end one activity (sometimes a preferred activity) and move to another activity (sometimes a lesser preferred activity). 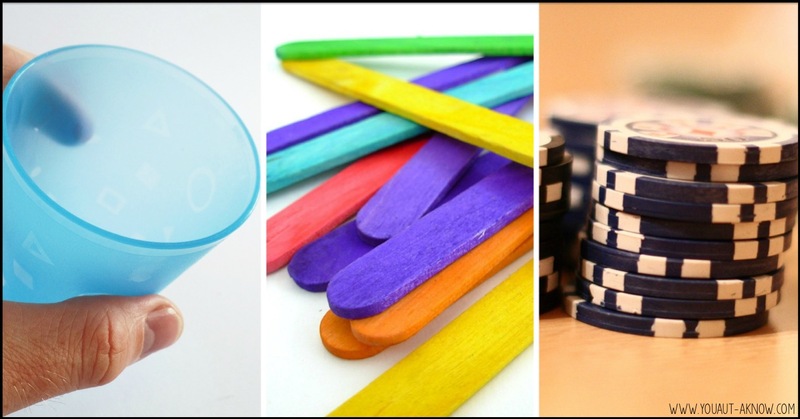 Transition items give a visual cue to the end of an activity and students are often better able to transition between activities with these items. 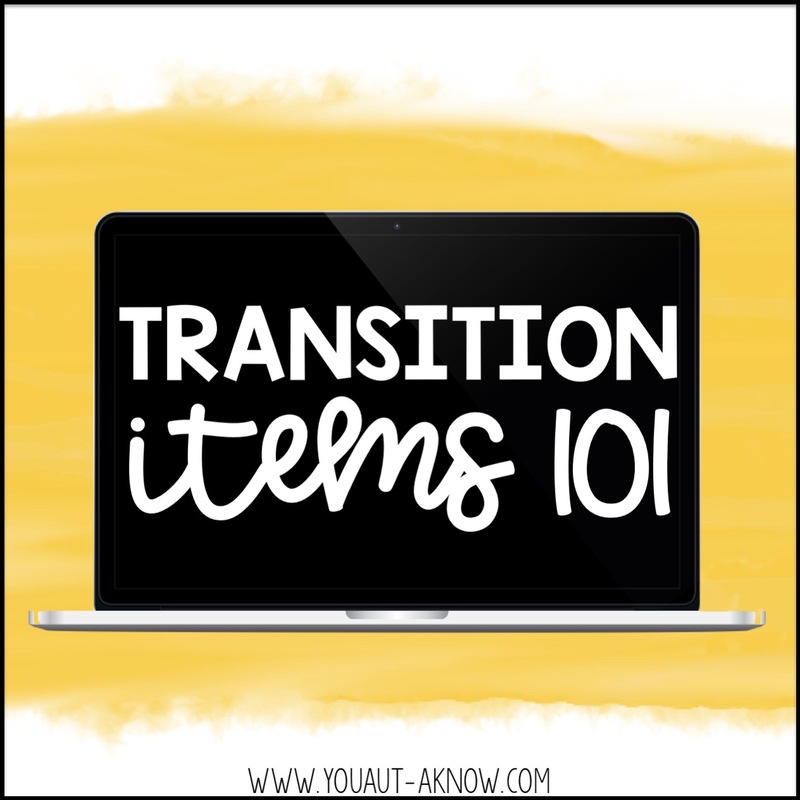 Transition items come in all forms. I talked a little bit about using transition items to ease anxiety earlier. Something I'll often do when students are completing a preferred activity is have them choose one toy, book, etc. that they can take with them to their next activity. We often have a box and a first/then chart near the center so students can store their preferred item and complete tasks to earn time with that item. It make transitions smoother for some students. Other students just need some extra visual supports when it's time to transition in the classroom. I have seen a variety of different transition items throughout the years that have been effective for different students. One student had difficulty transitioning from recess to snack. BUT THEY LOVED SNACK TIME! That didn't matter to the student because we were outside and the verbal cues of "Time for snack" were not enough. We started bringing the student's cup out to recess and handing it to them when recess ended. This visual cued the student to know what was coming next in their day. With some prompting an reinforcement, the cup became a transition item. The student would line up and walk with the class to snack time. Transition items have been a game changer in my classroom. Not only are my students better able to transition between activities, when they do struggle, we have a visual that we can refer back to.